The styles of lines within a plot may be easily changed by defining a line style and a line width. The plot function provides according arguments. By using the lty argument you may set the line type. The argument accepts an integer or a string value. 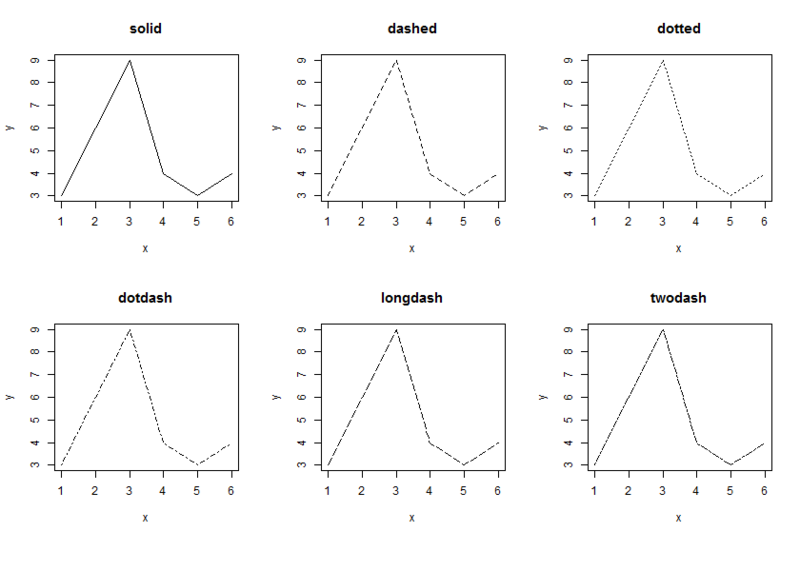 The following values are valid: 0=blank, 1=solid, 2=dashed, 3=dotted, 4=dotdash, 5=longdash, 6=twodash. If you don’t set the lty argument the default value 1 (solid) is used. The following example creates six plots with the different line types. I leave out the ‘blank’ style which creates an empty plot without any visible lines. One more way to change the line visualization is to set the line width. The plot parameter lwd is used for this purpose. The default of this parameter is 1 and for example a value of 2 means that the width is twice the normal width. The following example shows the same plot three times with different ine widths.